I am working on a design that basically involves cutting out a 4″ diameter disk from 1/4″ thick wood, with some shapes pocketed into the surface of the disk. I have been using 10 inches per minute (IPM) to cut through the Poplar and I had no clue if this is average, fast or slow. What I do know is that it is painful to watch. At 10 IPM cutting out the design took 67 minutes. That is probably split 60%/40% with the majority on the pocketing. Too long for my liking. I decided to try and reduce the cutting time. First I increased the speed to 30IPM, which is nearly the maximum that my PC can go. Next I reduced the depth of the pockets from 0.15″ to 0.10″. This saves an extra pass. The new time to cut? 20 minutes. Less than 1/3 of the original time. But that’s no good if the result is a ragged mess. Tonight I found out – there are more burrs on the wood, but the vertical edges look just as good as the ones cut at 10 IPM. So I will likely continue to use 30 IPM in the future. My next aim is to split the cutting into two parts. The pocketing with a 0.0571″ end mill and the rest with a 1/8″ end mill. This should reduce the time even further. If you search around for ideas on how to import DXF files into Inkscape or convert DXF files to SVG files, there are a lot of results. But they mostly seem to be shareware or orphaned applications that haven’t been updated for years. However there is a simple, obvious (once you see it) and free solution to converting DXF files to SVG files (which Inkscape can load). It’s called Open Office Draw. Yes, that’s right. Open Office Draw can load a DXF file and save an SVG file. I’ve tried it and it worked – I was able to take a DXF file, convert to SVG, load into Inkscape, edit, save as DXF (see my other posting from a couple of days ago on this) then load into CamBam for CAM processing. CamBam Plus has the option to automatically generate tabs. This is pretty nice and might make me change how I use fixtures to hold workpieces down. I’m starting to have concerns about the double-sided carpet tape, as I’ve seen the wood moving slightly during cutting. 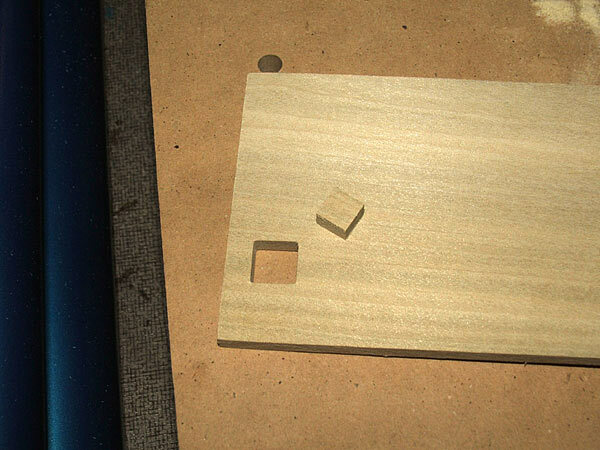 I decided to create a simple test – cut a 0.5″ x 0.5″ square with tabs, in 1/4″ poplar. Also I cut the entire piece out so I could examine it and show it off to people (total size is 1″ x 1″). CamBam Plus automatically generated the position of the tabs, but I needed to decide on the height and thickness. My first test using tabs with gears failed as the tabs were so thin they were non-existent. In this test they are 0.1″ wide and 0.07″ high. In order to saw the tabs later the outer profile cut has to be wide enough to get a tool in there. In this test it is 0.125″ wide. Here is the video – the final piece is shown at the end. 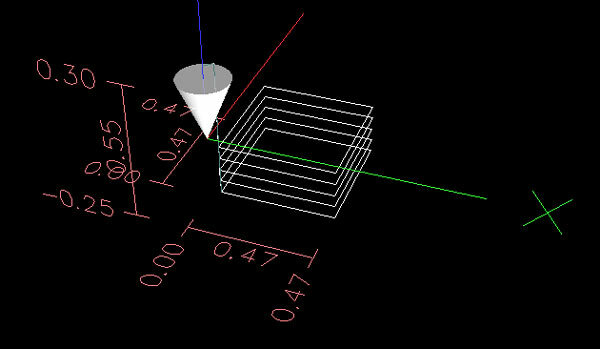 In the EMC2 image you can clearly see the tabs at the bottom of the cube on each side. Sorry about the poor quality. Today it was time to give some new gear generation code a try. Using CamBam I created gcode for a gear with a 2″ pitch diameter, 18 teeth, 20 degree pressure angle and a diametral pitch of nine. I then cut a couple of them out. The gears fit together nicely. 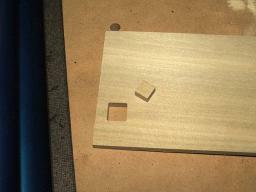 The next step in testing the CNC machine is to try cutting a hole. For this I needed thinner wood than the scrap pine I’ve been using. Home Depot sells small boards of oak and poplar so I picked up a piece of poplar. It’s 1/4″ thick. I also needed to raise the sacrificial platform so the tip of the end mill can reach the bottom of the wood. To do that I just cut some more 16″ x 9″ pieces of 1/4″ MDF and stacked them (see the post on fixtures for more information and pictures on what I am talking about). I used CamBam to draw a 0.5″ x 0.5″ square and then created a profile on the inside using my 1.45mm (0.0571″) end mill. CamBam showed me that I would have slightly rounded corners, but that’s ok. I decided to cut the profile in passes, increasing the depth by 0.05″ each time. This results in five passes to get to the bottom of the wood. Tedious, but better than stressing the end mill and Dremel. I was afraid that the tip of the end mill might bind in the sticky double-sided carpet tape so I held on to the poplar with one hand and kept my finger on the power button with the other hand just in case. I was also afraid that the cube being cut might fly out as it came free. It turned out pretty good. No sticky residue on the end mill and no gouging of the sacrifical platform. The cube in the center held in place during cutting and while I lifted the poplar. It came out when I removed the carpet tape. The cut is nice and clean with no burrs. I guess the carpet tape is a good method to continue using.